Luminar 2018 adds a new RAW file conversion engine, new photo editing filters, major speed improvements and a forthcoming digital asset management platform. Luminar is a universal all-in-one photo app designed to offer everything a modern photographer needs for photo editing. The Digital Asset Management platform will arrive in 2018 as a free update. The all-new Luminar 2018 brings power, speed and simplicity to the photo editing workflow, combining the advanced editing features and one-click adjustment tools to deliver incredible images in less time. San Diego, CA - November 16, 2017 — Introducing a new RAW file conversion engine, new photo editing filters, major speed improvements and a forthcoming digital asset management platform, new Luminar 2018 is now shipping at macphun.com/luminar priced at $69 for new users, $59 for Luminar for Windows Beta testers and $49 for current Luminar users, along with 14-day free trial. “With Luminar we don’t want to simply build another photo editor. But we want to bring photographers the first real Adobe alternative”, - said Alex Tsepko, CEO of Skylum. “We understand it’s a big promise, and a huge responsibility, but the positive feedback we have heard from thousands of photographers proves that we’re on the right track. Luminar is becoming a default photo software for more and more creatives, and we will continue to work hard to keep this momentum going”. Luminar is a universal all-in-one photo app designed to offer everything a modern photographer needs for photo editing. With intelligent filters and over 100 presets, Luminar speeds up the photo editing workflow to deliver great results in less time. It also features some advanced tools like layers, masking and blending, lens correction and transform tools — to name just a few — that take image editing to the next level. The previous version of Luminar was honored with a TIPA award for Best Imaging Software 2017 and three weeks ago won the 2017 Best Software Plug-in at the Lucie Technical Awards at PhotoPlus Expo, NYC. In 2018, Luminar will be updated with a new image browser & digital asset manager for efficient image library organization and management. 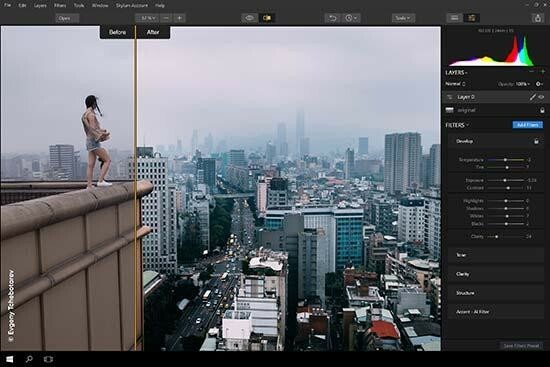 Photographers will be able to sort, rate, organize, and backup their photos, in addition to tapping the award-winning editing power of Luminar. The new digital asset management platform in Luminar will work without a subscription and will arrive as a free update to all Luminar 2018 users. NEW: RAW develop module that handles high-quality images faster and includes Lens Correction and Transform tools. NEW: Brand new streamlined user interface that speeds up working with presets, filters, and masks. NEW: Intelligent Sun Rays filter that recognizes objects and creates a natural yet impressive look. NEW: LUT Mapping (Look Up Tables)* delivers creative color, perfect black and white conversions, and digital films looks in seconds. NEW: Dodge & Burn filter is designed to selectively lighten or darken specific areas of an image. NEW: Brilliance and Warmth filter adds a rich tone and warmth, or can be used with negative values to cool down an image for a more subtle look. NEW: Matte Filter delivers a trendy vintage look with a silky matte finish. NEW: Hue Shift lets you roll the hue in a photo for subtle or dramatic changes. A little is perfect to eliminate unwanted color tints while a big adjustment is perfect for dramatic stylizing. NEW: Real-time noise removal that quickly fixes noisy (low-light) images. * Look-Up Table (LUT) – is mathematically precise way of taking specific RGB image values from a source image – and modifying them to new RGB values by changing the hue, saturation and brightness values of that source image. LUTs are used creatively to impose a specific ‘Look’ on a source image; tens of thousands are available from a variety of sources around the Internet. Mixed-computer households can share the same product key for Mac and PC which can be activated on 5 devices. A 14-day free trial is also available. The Digital Asset Management platform will arrive in 2018 as a free update for all the users of Luminar 2018.